Blue Ceramic Mug: Pumpkin Muffins with Zachary! I love fall. Pumpkins and apples and sunflowers (oh my!)... everything becomes radiantly beautiful for a few short weeks before fading into winter. The temperature cools to make it more comfortable to be outside, and I'm basically just a happy little camper. 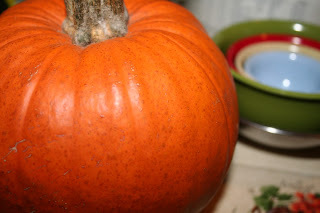 This year, I bought several sugar pumpkins, roasted a few and pureed them (yay Ninja! Best blender I've ever owned!). Monday evening, my son asked if he could make pumpkin muffins. He's 12 now, so about time for him to start learning to cook ;) I supervised (and did a little of the egg beating), but otherwise, he baked them all on his own.